When a married couple gets a divorce, a family court judge may order one spouse to make monthly “alimony” or spousal support payments to the other, based either on a settlement agreement between the couple or a decision by the court itself. The purpose of alimony is to limit any unfair economic effects of a divorce by providing a continuing income to a non-wage-earning or lower-wage-earning spouse. A family law attorney can help you determine if you should seek alimony, or if you may be required to pay alimony. Although awards may be hard to estimate, whether the payer spouse will comply with a support order is even harder to gauge. Alimony enforcement is not like child support enforcement, which has the “teeth” of wage garnishment, liens, and other enforcement mechanisms. The recipient could, however, return to court in a contempt proceeding to force payment. 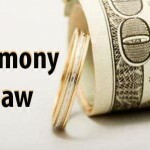 How Long Is Alimony Required To Be Paid? Alimony is often deemed “rehabilitative,” that is, ordered for only so long as is necessary for the recipient spouse to receive training and become self-supporting. If the divorce decree does not specify a spousal support termination date, the payments must continue until the court orders otherwise. Most awards end if the recipient remarries. Termination upon the payer’s death is not necessarily automatic; in cases in which the recipient spouse is unlikely to obtain gainful employment, due perhaps to age or health considerations, the court may order that further support be provided from the payer’s estate or life insurance proceeds. If you are considering divorce, it is essential to consult with an expert family law attorney to determine your rights and obligations in the area of alimony and spousal support. Contact us today to see how we can help with your alimony case!